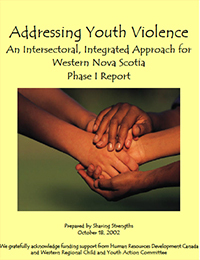 When grassroots groups in Western Nova Scotia got together to tackle the problem of youth violence in their community, they wanted to develop a strategy that was home-grown yet firmly based on research. The result was the Addressing Youth Violence project, for which Barbara acted as chief consultant. The intervention she designed for middle-school-aged childrena comprehensive approach that includes programs for schools, families, and the community as well as individual childrenis based on a literature review written by Judy as well as dozens of consultations with Family and Childrens Services, school boards, Ministry of Justice officials, police, probation officers, recreation workers, addiction services, and youth themselves.